There were still quite some half-&-half and bacon left in the fridge after the gals made clam chowder when they were still here last week. I decided to make another batch of clam chowder for RG and myself with the remaining ingredients using the same recipe that I had given the gals. I had modified the proportions and some of the ingredients to suit our taste buds. - Heat pan over medium-high heat. Add bacon and stir fry till brown and slightly crispy. Then add onions and cook till slightly soft & translucent. - Add diced potatoes and water and bring to a boil. Add more water if necessary during the boiling process and cook until potatoes are tender. - Pour in half-&-half and add butter and stir till butter is completely dissolved. Add the clams & the clam juice from the can. Cook over low-medium heat for another 10 minutes and keep stirring. - Depending on whether you like your chowder runny or thick....you can add some cornflour (add cornflour to a little cold water in a glass and stir to dissolve flour before adding the cornflour solution to the chowder) to thicken the chowder. - Top off chowder with some parsley flakes (omit if you don't like parsley). You can stop here and enjoy the chowder at this point by adding some oyster crackers to it. But I continued my cooking process by scooping the chowder into individual small baking dish and cut out enough puff pastry (I use Pillsbury flaky pastry) to press onto the edges of my baking dish to seal it. Then I placed the baking dishes into my preheated oven (350F) to bake till the puff pastries turn golden brown and puff up. The puff pastry on top of the chowder makes a more filling meal. 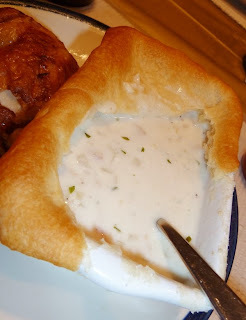 You can also serve the chowder in a bread bowl.